This past weekend I attended two very different, but very Alabama, events: the state book festival in Montgomery, Alabama, an all-day five-ring circus celebrating reading, writing, and publishing, and a memorial service on the grounds of Bryce Hospital in Tuscaloosa, the state mental hospital, locally referred to as “Bryce’s.” The book festival takes place over several blocks in Old Town Alabama, a grouping of historic buildings that reminds me of the Arkansas Territorial Restoration in Little Rock, Arkansas, where I had my first real job out of college, as a docent. Despite all the activity, everyone seems to slow down around old buildings, as though we are reminded that life is not all about rushing from place to place to place. I’m quite sure I saw fewer people on cell phones at the festival than I see on a daily basis around Tuscaloosa. On Sunday I drove down the long driveway of Bryce to the chapel, where I was happily surprised to see lots of cars parked all around the building; perhaps 150 people showed up for a ceremony commemorating and honoring the thousands of people who died while they were patients at the hospital, and dedicating a series of plaques that will stand at the old cemeteries where they were buried. The service opened and closed with a bagpiper, the haunting tones of the pipes filling me with a sense of melancholy and beauty simultaneously, somehow appropriate to where I was standing. Opened in 1861, inspired by Dorothea Dix’s efforts on behalf of the mentally ill, the historic grounds of the hospital will soon be purchased by the University of Alabama and a new, much smaller facility built. It’s the end of an era, and I was delighted to be able to tour the building in a group led by Bryce historian Steve Davis after the ceremony. 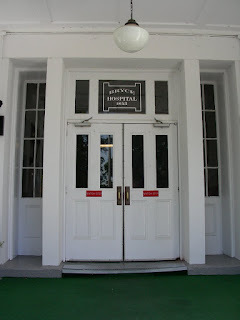 As I walked the halls of the main building, I tried to imagine Sara Mayfield, journalist, novelist, sometime patient of Bryce, as she waited for her mother to take her shopping or walked to the dining room where she supplemented the meals with items she ordered each week from Sam Jackson’s grocery. Originally from Montgomery, Sara would have known the downtown streets I’d driven to the festival, might have visited her father, a state supreme court justice, at the state capitol on Goat Hill. 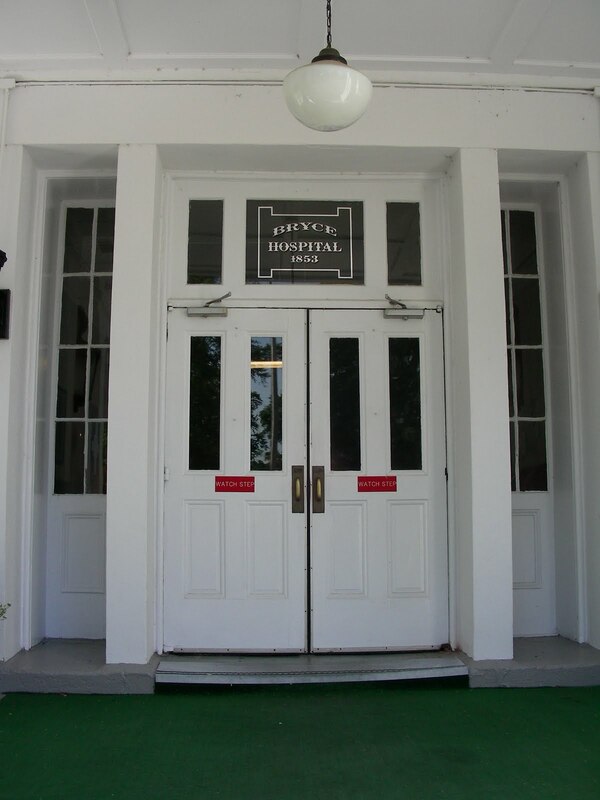 And after 17 years at Bryce, she must’ve known all its hallways, its staircases, its grounds. If she were alive now, perhaps she would herself be reading at the book festival. Funny to think about.